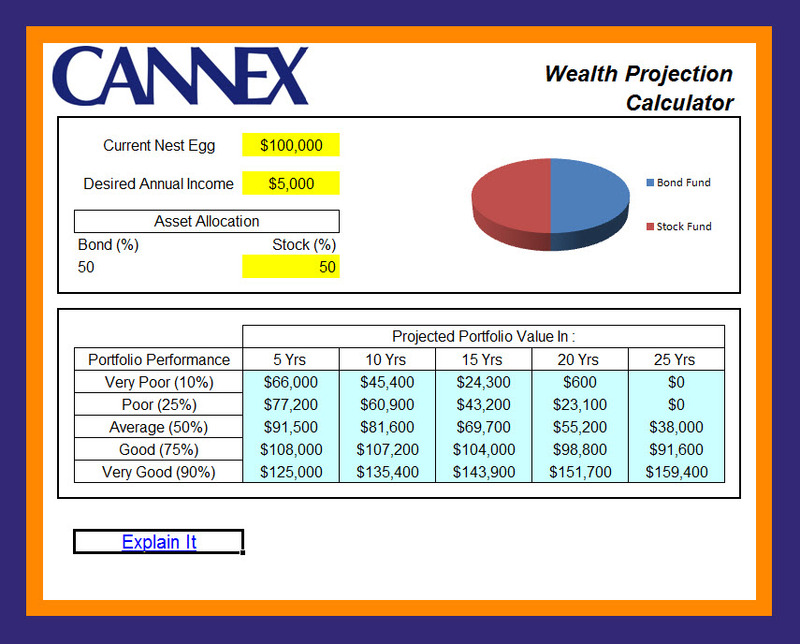 CANNEX NumeRIcs™ equips financial specialists with analytic tools to explore and solve the most important questions in retirement income planning. CANNEX NumeRIcs is available in two variates: one targeted at financial advisors (CANNEX NumeRIcs for Advisors) and the other at quantitative financial analysts (CANNEX NumeRIcs for Quants). Both varieties of CANNEX NumeRIcs are offered as add-ins to Microsoft Excel or MATLAB. Below, we have presented a few examples of the analytic capabilities of the Add-In using our QuickStart Workbook. If you are interested in learning more about or licensing CANNEX NumeRIcs, please contact us at cannex@cannex.com. What’s the chance your client will run out of money in retirement? What’s the maximum amount your client can safely withdraw each year? What’s the best asset and product allocation to optimize the sustainability of your client’s nest egg? How do you identify tradeoffs between spending today and a financial legacy for tomorrow? The Retirement Sustainability and Financial Legacy Calculator allows you to quickly and easily find the answers to these questions and more. Working with basic data you enter about your client today, this calculator shows you and your clients the sustainability of their retirement income strategies and their projected financial legacy. From there, you can swiftly test changes on the fly, using the calculator to project and evaluate alternate scenarios and allocations. 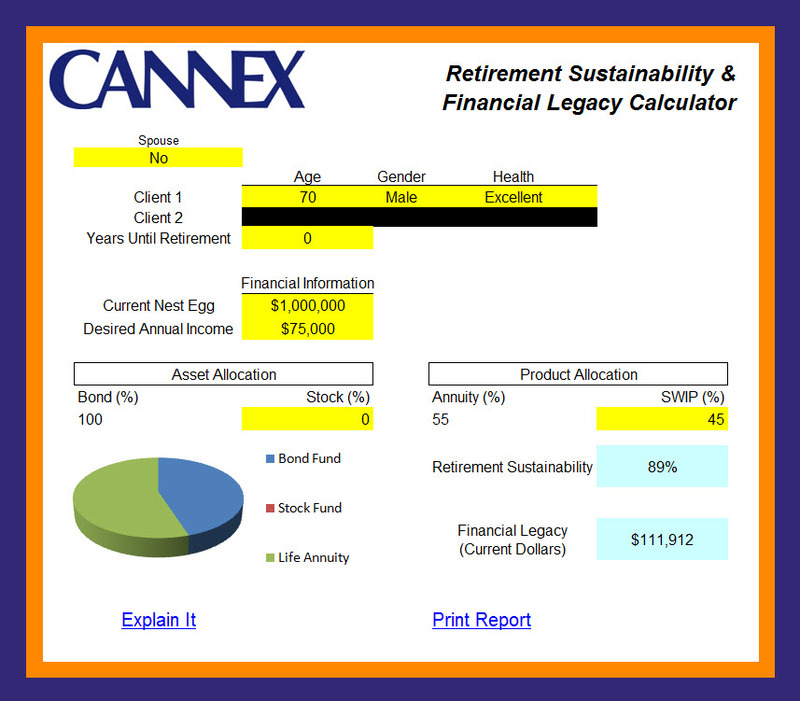 The Retirement Sustainability and Financial Legacy Calculator incorporates the randomness of investment returns as well as random life expectancy — bringing the power of analytic solutions to your desktop, for the benefit of all your clients. Your clients depend on you to help them plan for the future. But how do you confidently assess the likelihood of their future wealth? The Wealth Projection Calculator identifies a range of possible future portfolio values for your clients, as well as the likelihood your client’s portfolio will fall within any portion of that range. Bring clarity and confidence to your client’s retirement income plans by projecting an array of possible outcomes, as well as the probability for each outcome.